Researchers in the Robotics Institute of Carnegie Mellon University's School of Computer Science are building a robotic prospector for NASA. A prototypelunar prospecting robot called "Scarab" has been developed atCarnegie Mellon's Robotics Institute. Once Scarab (see photo)and its kin have crawled the Moon, developers will use the lessons learned toutilize resources in the soil of other planets. 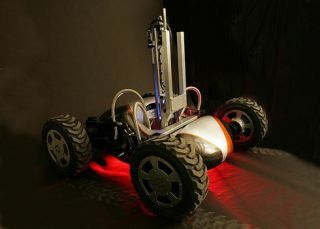 The drill on the robotis able to obtain "meter-long geological core samples and features a novelrocker-arm suspension that enables the robot to plant its belly on theground." By placing the drill at the center of the robot's body, Scarab isable to apply sufficient downward force for drilling while keeping its weightat 250 kilograms. Scarab solves the problem of working in dark craters (not tomention the 14 day lunar night) by using an advanced sterling radioisotopegenerator (ASRG). The ASRG is a device that converts the heat of isotope decayinto electrical power. This generator provides energy for ten years ofactivity. Science fiction writers have been thinking about mining onthe moon for at least seventy-five years; RayCummings wrote a very lucid description of lunar mining in1931. Jerry Pournelle and Larry Niven thought up the idea of telepresencebulldozers; the bulldozer was on the moon and the operator was here onEarth. Via TheTartan (Carnegie Mellon's student newspaper).